On October 27, 1914, this village saw the first action taken by the Indian Corps which attempted to take it from the Germans. It was not until March 10, 1915 that the second attempt took place with the Indian Meerut Division assisting the 8th Division. This was to be the first time that aerial photography played a prominent role in a major battle with the entire German lines being mapped from the air. Losses sustained were immense, particularly to the Middlesex Regiment and the Cameronians, given the inadequate preliminary bombardment leaving the barbed wire in front of German positions uncut. After four days 2 kilometres were taken. 40,000 Allied troops had taken part in the battle and of these 11,200 (7,000 British, 4,200 Indian) were lost. What was left of the village was defended by the Portuguese Division of all groups during the 1918 Battles of Lys. Originally known as Moggs Hole Cemetery, this today is the final resting place for 50 Commonwealth servicemen, it was created during the battle, and used until November 1916. This cemetery is inside what was No Mans Land before the battle. There are now over 60 buried here with nearly half unidentified. This beautiful memorial is circular and has inscribed the names of many of the missing Indian soldiers on panels that are joined with regimental crests of Indian Army Units. Throughout there are Indian features and motifs, and in the foreground is a 15-metre high column surmounted by a Lotus capital, the Star of India and the Imperial Crown. On either side of the column two carved tigers guard the memorial. Return to your homes in the distant, sun-bathed East and proclaim how your countrymen drenched with their blood the cold northern land of France and Flanders, how they delivered it by their ardent spirit from the firm grip of a determined enemy; tell all India that we shall watch over their graves with the devotion due to all our dead. We shall cherish above all the memory of their example. They showed us the way, they made the first steps towards the final victory. Later additions to the memorials commemorated other Indian Army dead of both World Wars. There are two recipients of the Victoria Cross commemorated on the Neuve-Chapelle Memorial: William Arthur McCrae Bruce, and Gobar Sing Negi. Just along the road from the Indian Memorial is a reminder of yet another nation which fought in the 1914-1918 war; the Portuguese and their cemetery at Richebourg. On April 9, 1918 the German Army launched Operation Georgette in the Lys Valley in the hope of a decisive victory before the arrival of further American reinforcements. In three successive waves, ten divisions overwhelmed the two Portuguese divisions which were incomplete, badly organised and taken by surprise as they were in the process of being relieved. Portuguese losses amounted to 7,500 men on that day, and yet the next day, shoulder to shoulder with the Scottish, the survivors defended La Couture near Béthune before eventually being forced to retreat. The Germans took Estaires, Armentières and Bailleul but failed to take Béthune and Hazebrouck. Operation Georgette was called off on 29 April. The Portuguese had suffered heavy casualties in this action and as was so often the case in the 1914-1918 war many of the men killed were beyond identification and 239 of the graves at Richebourg are marked with the Portuguese word "Desconhecido" or "unknown". The site of the cemetery/memorial takes up both sides of the road and on one side there is a chapel dedicated to Our Lady of Fatima and on the other side, behind an imposing entrance and a wrought-iron gate, is the Portuguese National Cemetery, the final resting place of 1,831 soldiers and the only place of remembrance to honour the Portuguese soldiers of the Great War. Abandoning neutrality in 1916, the young Portuguese Republic had entered the war on the side of the Allies. The Portuguese Expeditionary Force comprised up to 56,500 men and, under the command of the British Army, was assigned to the front in Flanders between the villages of Laventie and Festubert. The Portuguese Command took up quarters in Peylouse Manor in Saint-Venant. In honour of the soldiers who defended the village of La Couture, the French and Portuguese governments inaugurated a monument there in 1928. The monument's frieze shows the ruins of a Gothic church and an allegory of the Portuguese Republic coming to the aid of one of its soldiers. 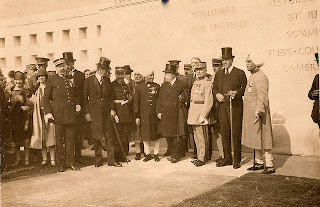 The two Portuguese divisions sent to the Western Front came under British command. They were badly beaten in the first of the German spring offensive in 1918. Besides this military cemetery there is a monument to the Portugese Army in the French village of Couture in Flanders near the Belgian frontier. The war was not universally popular in Portugal with mobilisation failing top provide any economic boost. The military coups and other political upheavals sparked by the declaration of war continued after 1918, eventually resulting in the Salazar Dictatorship which lasted into the early 1970s. At Paris Portugal had been rewarded with a tiny piece of German East Africa along the northern Mozambique border known as the Kionga Triangle. This lone memorial stands just outside the Indian Memorial alongside the road in remembrance of Cyril Alfred William Crichton who had been in the the Garhwal Brigade supporting the Meerut Division's attack on the southern part of the village on the opening day of the Battle. He and his men went over the top and charged across 200 yards of open, cratered country in full view of the enemy, cheering as they went. Crichton called "Follow me" but fell after a few yards, shot in the leg, but struggling to his feet he shouted "Charge" and staggered on. He was wounded again, this time mortally. This monument was erected by his parents, distressed that his body had never been recovered and he had no final resting place. 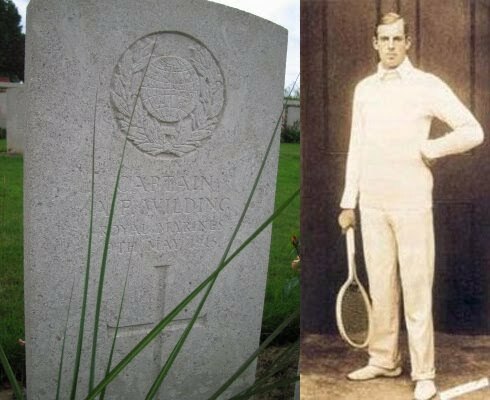 In fact, it was eventually found on February 27, 1925 on the other side of the road after being disturbed by the plough, his identity being discovered through his identity disc and silk handkerchief, and he was buried at Le Touret CWGC. It was damaged when the Indian Memorial was shot up in 1940 and later by a vehicle, but later repaired. In 1965 to accommodate road widening, it was moved to the lawn outside the Indian Memorial where it remains. On 30 June 1916 this was the site of the Battle of the Boar's Head, a diversion for the Battle of the Somme fought by the 11th, 12th and 13th (Southdowns) Battalions of the Royal Sussex Regiment. After a bombardment of the German trenches the 12th and 13th Battalions went over the top (most for the first time) and, under heavy fire, attacked the enemy trenches, bombing and bayoneting their way in. The 11th Battalion supplied carrying parties. 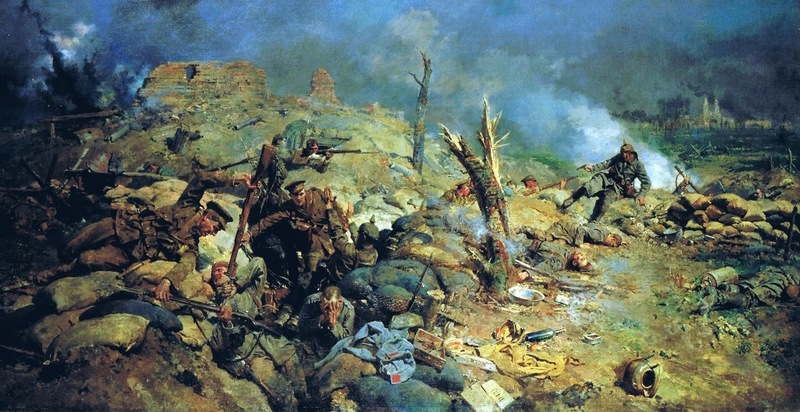 They succeeded in taking the German front line trench, holding it for some four hours, and even briefly took the second line trench for about half an hour, beating off repeated counter attacks, and only withdrew from the shortage of ammunition and mounting casualties. 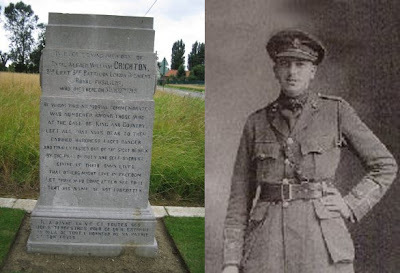 Over a period of less than five hours the three Southdowns Battalions of The Royal Sussex lost 17 officers (including CSM Nelson Victor Carter, who posthumously won the Victoria Cross for his actions in the battle) and 349 men killed, including 12 sets of brothers, including three from one family. A further 1000 men were wounded or taken prisoner. In the regimental history this is known as The Day Sussex Died. The following day the Battle of the Somme began and 20,000 died on the first day. Above arches within the walkways, and elsewhere are engraved regimental insignia of the units whose men are commemorated here. 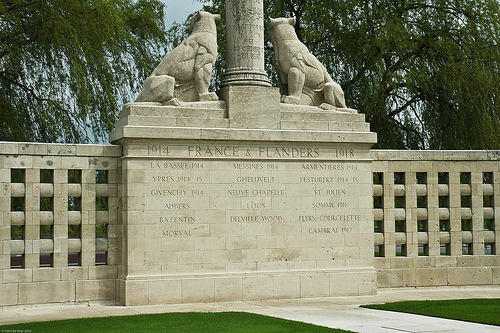 This huge Memorial is in the form of a loggia lined with panels listing the names of the Missing on one side, and which are open with interspaced columns on the other side. It commemorates those with no known grave who died in the area. In the centre of the memorial, between the walkways, is a grassed area "courtyard" area containing a stone column, with the dates 1914 - 1918 etched on it in Latin numerals. Inscribed above the arches in this courtyard are the names of the battles and actions fought in the area:La Bassee, Festubert 1914, Givenchy 1914/1915, Cuinchy, Neuve Chapelle, Aubers Ridge and Festubert 1915. On the northern side of the village is this cemetery which is sited in an old orchard between two farm buildings, where a trench tramway had its terminus and a Dressing Station was established. Nearly 800 soldiers are buried here, including 91 Germans (34 unidentified). Originally, eleven Portuguese soldiers were buried here but were moved to the Portuguese Military Cemetery nearby.